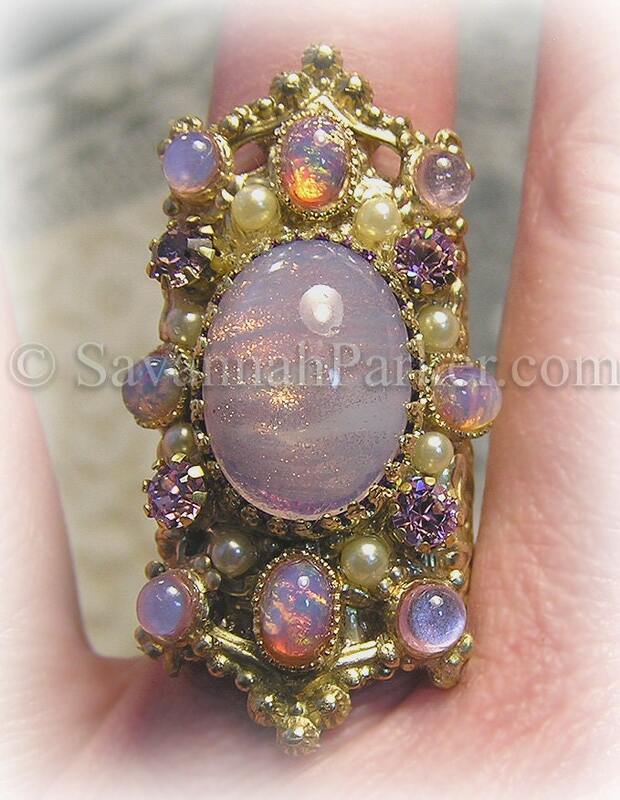 Antique Style Victorian Edwardian Rococo GORGEOUS vintage lavender glittery art glass and lilac glass fire opal filigree ring---would have looked right at home on Marie Antoinette's finger! 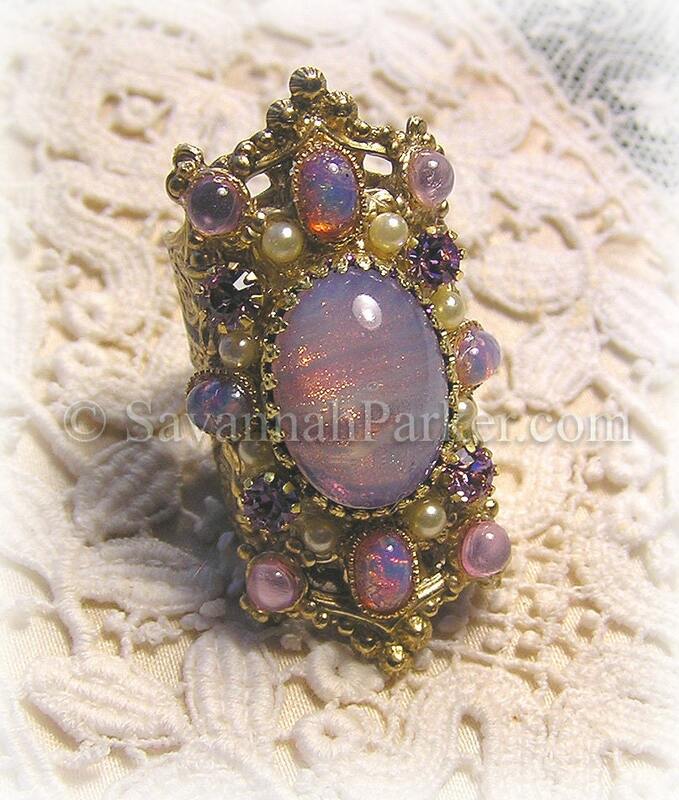 This completely handmade ring is wonderfully wearable and showcases some of my finest and most rare vintage stones and findings.....I designed and created this beautiful and elaborate antique Victorian/Edwardian style ring using mostly antique components and hand finished/burnished brass parts & filigree. PLEASE READ THE DESCRIPTION CAREFULLY before asking questions! All details about sizing, etc. are addressed here, so it's very important to READ all of this...thank you :-) ALSO PLEASE NOTE there is generally a five to six week completion time before shipment of this item as each one of this limited edition design is individually hand made by me, to order---if the waiting time presents a problem for you please do not purchase. 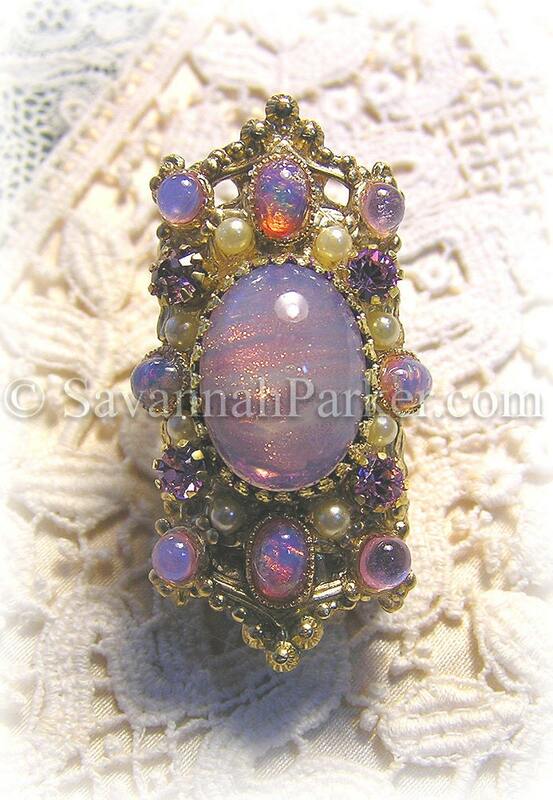 All of my rings are COSTUME JEWELRY and not meant for heavy use or daily wear! 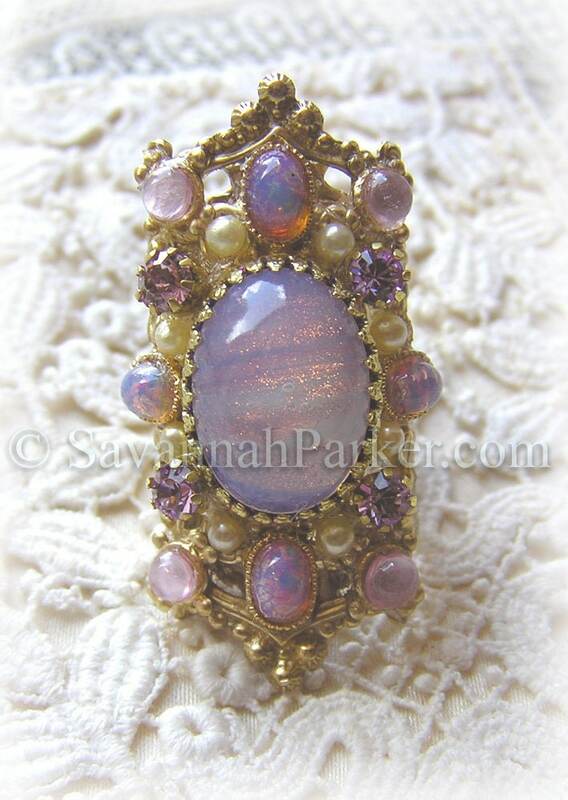 As a long-time antique clothing and jewelry collector, I'm inspired to create antique/vintage-style jewelry that has the superb old elements and rare vintage glass stones and beads I have gathered over the years....All of the pieces I do are individually hand made and incorporate as many of the antique elements as possible, plus durable yet authentic brass fittings that I have hand finished with that "aged" look.As a long-time antique clothing and jewelry collector, I'm inspired to create antique/vintage-style jewelry that has the superb old elements and rare vintage glass stones and beads I have gathered over the years....All of the pieces I do are individually hand made and incorporate as many of the antique elements as possible, plus durable yet authentic brass fittings that I have hand finished with that "aged" look. 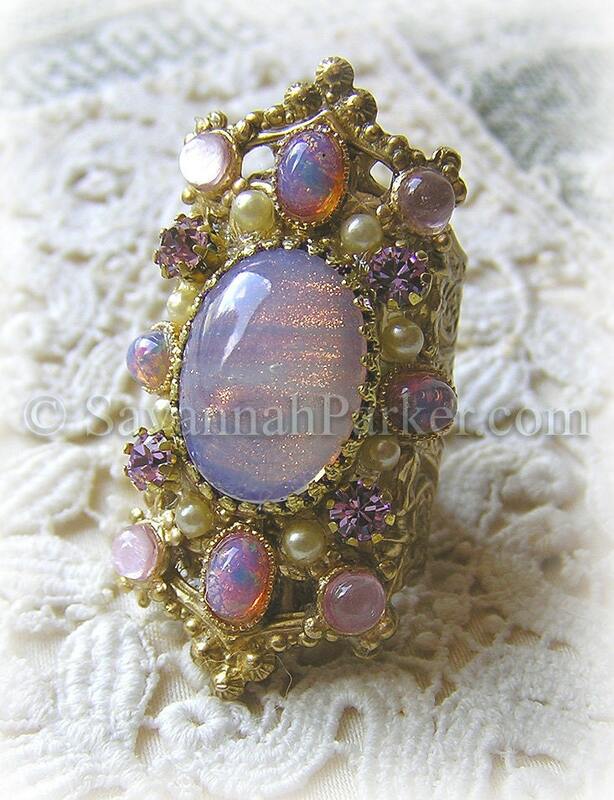 Often my pieces are one of a kind, however I've found that when I have a small supply of vintage stones or elements, it's nice to be able to keep more than one person happy by creating limited editions...that way more people have a chance at owning something they particularly love! 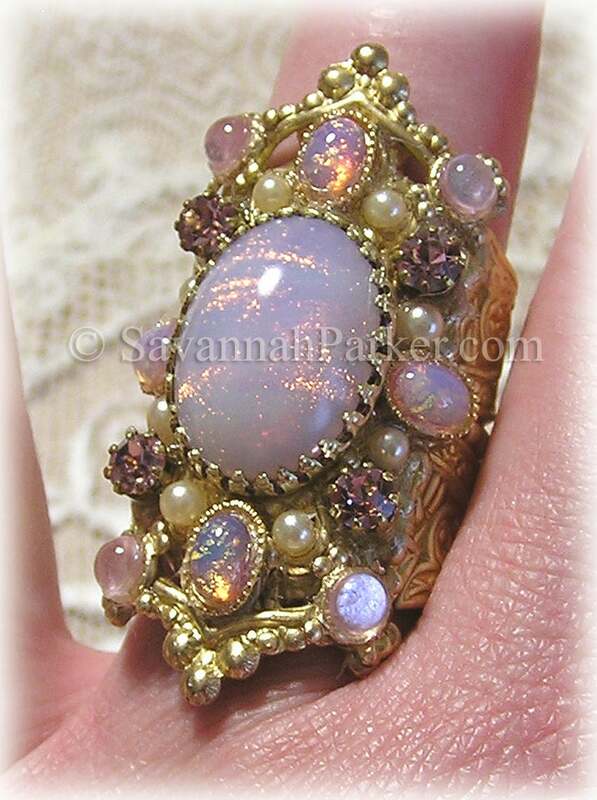 This exquisite completely handmade ring is fashioned from very substantial burnished rich solid brass parts patterned with extraordinary Victorian designs, with a totally FANTASTIC center stone of a rare oval vintage lavender opalescent glittering art glass cabochon --this stone is a wonderful opaline soft lavender (very similar shade to lilac jade) with many pink glittering striations deep within the glass, making it look just like pink fire within the soft luminous lavender....especially when the sunlight hits it; just like a gorgeous lilac sunset! 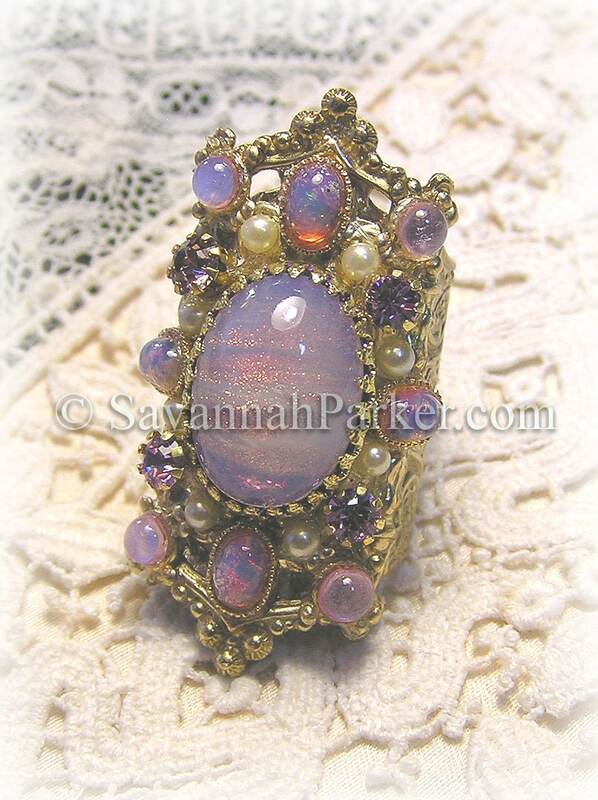 It is surrounded by tiny ivory glass pearls and gorgeous small lilac glass fire opals along with glittering lilac rhinestones set in brass, and tiny round frosty-lavender glass cabochons as well, at each corner of the large Victorian-Rococo base. 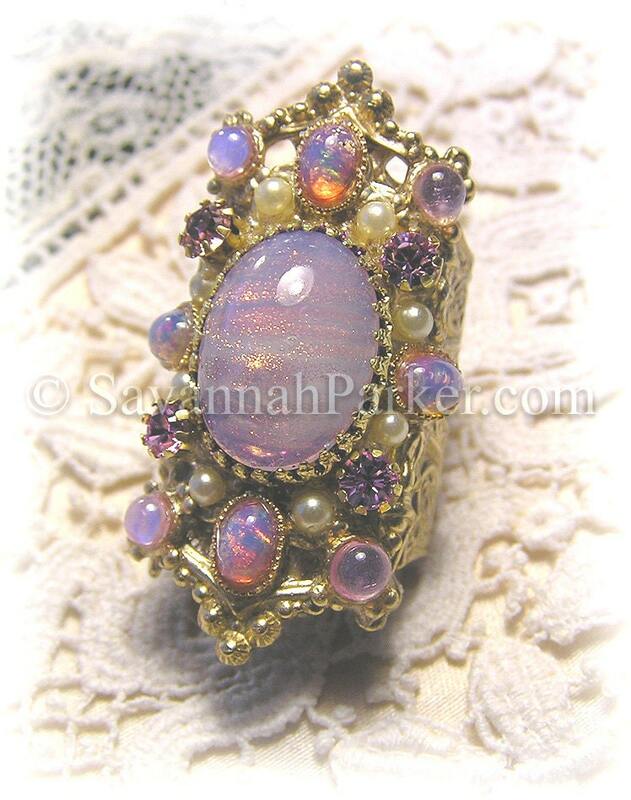 As shown, this ring is adjustable from a size 5 upwards....this can be done by simple stretching of the back to fit the individual finger.....however if you require a size 9--13, please be aware that I will be adding extra brass filigree to the ring to make it fit that size range comfortably, before shipping. Please be sure to select the required basic size when purchasing so I can preadjust it for you. 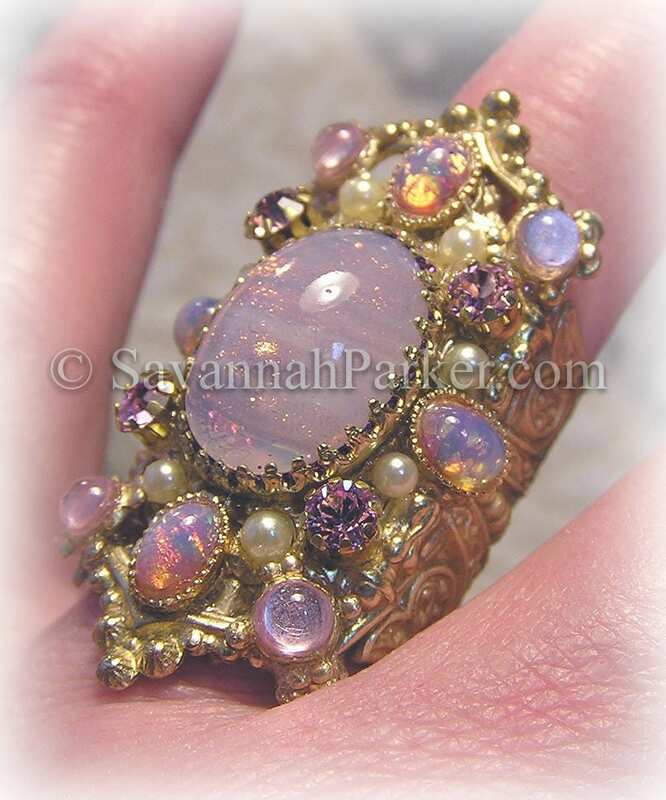 Since it's extremely imposing---almost 2" from top to bottom-- and reaches quite well past the knuckle on most hands, this would be great worn on the middle or first finger....This is quite a substantial ring, so if you have very small hands, please consider how & if it will suit you---I won't be responsible for it "looking too big" on you, or appearing a different shade on your monitor than it does in real life, etc.....nor do I accept returns or do exchanges. The stones & findings I use in my jewelry are all wonderfully unique & mostly vintage, and come from my ever-growing stock of fine antique, rare and vintage beauties---am always searching for gorgeous old elements to recreate that fabulous old antique look....Very comfortable & substantial on, and I always "test run" my jewelry to make sure it's very durable and sturdy....this one is a great addition to any vintage and antique lover's costume jewelry collection!